One of South Africa’s most respected providers of mineral processing and bulk materials handling solutions, ELB Engineering Services (ELB), part of the JSE-listed ELB Group Limited, is now approaching the completion of two major projects which have demonstrated its ability to successfully execute challenging assignments notable for their size and technical sophistication. Modern Mining recently spoke to ELB’s CEO, Dr Stephen Meijers, about the company’s achievements and its strategies for ensuring continued growth in the future. The two projects are Vedanta Zinc International’s Gamsberg project near Aggeneys in the Northern Cape, now commissioning, and the materials handling component of Eskom’s giant ‘new generation’ Medupi Power Station in Limpopo Province, which ELB expects to complete in the first quarter of 2019. The Gamsberg zinc project near Aggeneys in the Northern Cape. Commenting on Gamsberg, Meijers says the company’s scope of work has included not only the 4 Mt/a zinc concentrator plant, which is one of the most advanced of its type in the world, but also the design and construction of a 40 km long water supply pipeline which brings water to the Gamsberg site from the Orange River, as well as the project’s power infrastructure. ELB won the contract – structured as three separate work packages – in late 2016 in the face of intense competition from both local and international competitors. Meijers notes that the concentrator incorporates – for the first time in Africa – Staged Flotation Reactor (SFR) technology from one of ELB’s many international partners, Canada’s Woodgrove Technologies Inc. Among the benefits of the SFR technology are a smaller plant footprint, a major reduction in power and air consumption (compared to conventional flotation plants) and reduced wear and maintenance costs due to lower impeller tip speeds. “The technology is cutting edge,” states Meijers. Woodgrove has not been the only international partner of ELB to participate in the project. Also involved is ENFI, one of China’s leading engineering companies operating in the non-ferrous field. “ENFI was responsible for part of process design and detail design as per the scope of work of the contract with ELB being responsible for the detailed design and the construction,” Meijers explains. He adds that the construction was undertaken by ELB Construction (ELBCON), ELB’s construction arm, with another group company, B&W Instrumentation & Electrical, handling the electrical and instrumentation (E&I) work. ELB’s work has entailed the design, supply, erection and commissioning of the terrace coal and ash handling facilities comprising 54 conveyors which feed the coal into the power station’s six boilers and remove the ash for disposal. These conveyors transport the coal and ash at rates varying from 80 t/h to 2 100 t/h. The project also incorporates an emergency ash disposal facility inclusive of a 2 000 t/h stacker and a 500 t/h scraper reclaimer. One overland conveyor project that has already been secured by ELB is the 27,1 km long overland conveyor forming part of the Project 5 Million Expansion at the Asanko Gold Mine in Ghana. ELB has already completed the FEED phase for the conveyor and is the nominated contractor for the construction phase, once it is approved. The conveyor will have a 7 Mt/a capacity and will link the existing Asanko processing plant with Asanko Gold’s new Esaase mine. An interesting new power project that ELB has just started on is a 25 MW biomass plant for Ngodwana Energy at Sappi’s Ngodwana mill in Mpumalanga. Forming part of the South African government’s Renewable Energy Independent Power Producer (IPP) Programme, the facility – which will take 27 months to construct and commission – will use waste material from the surrounding plantations to generate power. It requires a high-efficiency air pollution control system to ensure that emissions are well below the new South African requirements. Another important recent award to ELB is a contract for the design, supply, installation and commissioning of two mobile ship loaders – equipped with 58 m telescopic booms – at Transnet Port Terminals (TPT)’s Saldanha terminal. The ship loaders come complete with a mobile truck loader with a capacity of 1 000 t/h across both Handymax and Panamax bulk carrier vessels. The project follows ELB’s recent successful refurbishment of a tippler at TPT’s Port Elizabeth Terminal. Its technical partner on the Saldanha contract is Telestack of Northern Ireland, widely acknowledged as a leader in the design and supply of mobile materials handling equipment. In the marine field, ELB has been awarded a contract to install a drying system for De Beers Marine’s Grand Banks alluvial diamond concentrate exploration vessel, which is being upgraded in Cape Town harbour. ELB’s scope of work includes the design, manufacture, factory testing, delivery and commissioning of a pneumatic Drycon drying system rated at 1,5 t/h. Among projects that have recently been completed by ELB are a Rapid Train Loading Station (RTLS) for the Nchwaning mine, part of Assmang’s Black Rock Mine Operations (BRMO) in the Kalahari Manganese Field of the Northern Cape (BRMO is operated by Assmang Proprietary Limited, which is jointly owned by African Rainbow Minerals Limited and Assore Limited); a sack tipping unit – complete with an integrated filter system – for Unilever Nigeria; and a clinker loading upgrade project at PPC’s Colleen Bawn factory, 160 km south of Bulawayo in Zimbabwe. The acceptance criteria for the new loading system at Colleen Bawn included being able to load a 30-rack train within six hours. This was achieved even though site restrictions increased the shunting time by only allowing eight wagons to be loaded in a single run. ELB’s current order book and its recently completed contracts give an indication of the diverse nature of the company’s offering and also its geographical diversification. 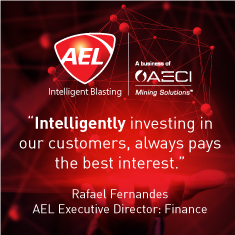 “One of our strengths is that we’re engaged in so many different fields including materials handling, process plant design and power supply over a range of industries, most particularly mining and power generation. We’re also active throughout Africa although currently the bulk of our work is in South Africa. Our diversification in terms of what we do and where we do it has enabled us to maintain a respectable order book and remain profitable over this very long downturn in mining,” Meijers observes. While ELB – which will be celebrating its centenary next year – has built its reputation on its mainstream engineering and materials handling skills, increasingly it is positioning itself for what has been dubbed the ‘Fourth Industrial Revolution’, which builds on the digital advances seen over the past several decades. In particular, it has entered into a technology partnership with IoT.nxt, a relatively new South African company which has created a platform through their RaptorTM Intelligent Edge Devices that allows operations to seamlessly integrate existing legacy systems as well as state-of-the-art sensors, improving efficiency and driving down costs. In another technological step forward, ELB has also just been appointed as a business partner of US-based Kymeta Corporation, which has developed ground-breaking new ‘plug and play’ satellite antenna technology that promises to revolutionise the field of connectivity. The Kymeta™ technology overcomes the limitations of conventional satellite antennae and offers full broadband connectivity anywhere in the world, at any time, at competitive prices. Meijers sees many applications in the mining field, including the control and monitoring of process plants.